How long have you worked as a pharmacy technician? I been a pharmacy technician for almost 3 years. Are you certified? Do you belong to any pharmacy technician organizations? Yes I am certified in the state of Illinois. No not yet. I might start my own organization soon. Why did you decide to become certified? Would you recommend certification to other pharmacy technicians? doing our job and show them we can do it and make our patients feel safe with their health on our hands. We need to be alert and careful when filling these medications to prevent medication errors. I do recommend to get certified because it makes you knowledgeable, provides a higher pay rate, helps you gain confidence towards your profession, and gives a step up to make a difference. How did you study for the certification test? What materials, how long, etc? I self-studied and found any tools through the internet that could possibly help me. I also studied my pharmacy tech books from my past pharmacy tech course. I took a ptcb practice test or two for sure. It took me 2 months to study. Why did you decide to become a pharmacy technician? What is the best part of being a pharmacy technician? Would you recommend this profession to a friend?I wanted to know and learn about medications, I was interested in knowing how these medications work in our body. How a small tablet can make a difference in our body. I am a warm person and I have a motherly spirit, and I just want to make others feel welcome and possibly get their health in the right track. I love filling medications into the vials, but at the same time it is important to be alert, because so many medications look similar and sound similar. I do not want to send someone’s health down the drain. I certainly do not want them to have an adverse effect. Yes I would recommend this profession to a friend, but I would alert him or her to the fact that this profession is not easy. It comes with its ups and downs, and one should make the best out of it. Knowing that a patient left happy with their medications makes me happy. I do not have a position at the current time. I am concentrating on my children and my website. I used to work for Osco pharmacy in Chicago, IL. I landed that position from my internship. 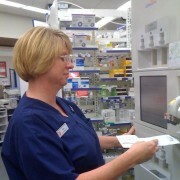 Why did you start your pharmacy technician blog? How did you start it, is it a lot of work, and where do you get the information? I launched my website/blog in the beginning of 2010. I launched it because I know how it feels to be confused regarding what to study for the PTCB Exam, and I just want to help other techs and give them heads up towards what tools they need to help them prep. I also provide health information throughout my site to get some knowledge in our brains. I am sure this knowledge will help others advance and understand why certain medications treat these health issues. The site was lots of work, but it was well worth it, and I love doing it. I get my information from personal experience and from study notes. Everything that I learn and experience I put together voila, we have a learning tool that will surely benefit us in the present and in the future. 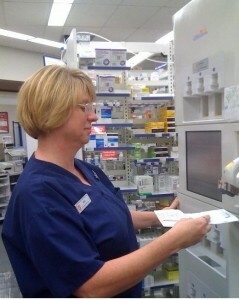 What are your plans for the future in the pharmacy technician field? My plans are to get back in the pharmacy field again and give it my all, expand my website, and help others in need. What are you interested outside of pharmacy? Well I like to take my children out and have some fun. My 5 year old enjoys book shopping. I take church (RCIA) classes, I tutor pharmacy techs all over the world and also study. I like to hang out with my friends and my daughter’s dad. I like to go dancing and cook. Oh and I like to workout, keep myself in shape! I also help others eat healthy and show them a few workouts to lose weight. I have worked most of my life in a 9 to 5 job. I have always had an interest in being a pharmacist but never pursued the career. So one day I got fed up with office politics and applied at my neighborhood pharmacy (Walgreens). There were no pharmacy technician openings but got my foot in the door. I loved working different hours, having days off in the middle of the week and mostly I loved my customers. Once I got some experience in retail, I jumped on the opportunity to become a technician as soon as I heard there was an opening in my store. I made sure the pharmacy staff knew who I was and that I was a team player and hard worker. I had no trouble transitioning into the pharmacy. I have been a technician for 5 years. I became certified after 4 months on the job and by the end of my first year, I was promoted to Senior Tech. My employer has an excellent prep course. I also used a PTCB practice test. The passing rate is 98%. Since I was over 40 when I started this position, I was not used to studying. There is a lot to learn, especially because the test covers all types of technician scenarios. You have to study for hospital, retail, administration, and even history and law. Do you belong to any pharmacy technician organizations? I do not belong to any organizations but I sign up for any group or information on the web, read any magazine I can get my hands on, take continuing education courses to keep up with the ever changing pharmaceutical world. What is the best part of being a pharmacy technician? The best part is my customers. I enjoy helping people, whether its finding a product on the shelf or researching it on the web. I am a problem solver which is an important part of the job. In retail pharmacy, its all about the customer. They may be sick or frustrated. They may get short with you. But if you learn to not take it personally, and concentrate on helping them, they appreciate it. Would you recommend this profession to a friend? Depends on the friend. Being a technician is a hard, but fulfilling profession. You must be able to multitask. One minute you are answering the phone and the next you are typing and filling a script. Not only do you deal with the public but you are in constant communication with doctors and their staffs, hospitals, insurance companies, customers, other pharmacies and each other. You’re responsible for inventory and supplies, scheduling and ordering and drug recalls, naming a few. You must know computers and be able to type. You must have compassion and patience. It’s a lot of work, but I wouldn’t have it any other way. Retail pharmacy is challenging. I hope to continue working as a pharmacy technician for many years to come. I believe that there will be more jobs with more responsibilities and I look forward to the learning more especially in the compounding and nuclear areas. What are your interests outside of pharmacy? I am a lover of logic puzzles, Sudoku, crosswords and any problem solving activities. I love to research and learn about almost everything.